We had a terrific weekend with our daughter and friends from Toronto, newlyweds Bhaskar and Farhanna. Farhanna and I had a blast cooking Bengali food (that’s another post coming soon) and we ate all weekend! After the weekend, the newlyweds went to a local resort for a couple days, but I asked them to come back for a care package from me before they headed to Toronto. 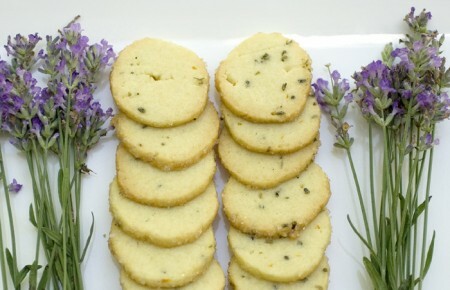 So, I wanted something special for the care package, and decided that some unusual butter cookies with different flavourings would fit the bill. 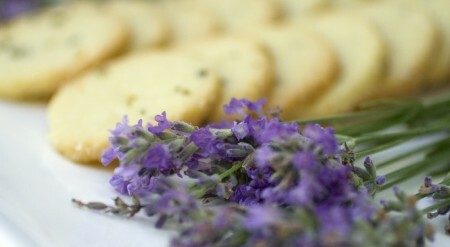 I love lavender and also grow it in my Muskoka garden. I grow the English type and it flourishes even here in garden zone 4. The type I really love however is the French type grown in Provence. There are also lavender farms in Ontario that are experimenting with different types and their hardiness. My lavender was in full bloom, so thus my inspiration. 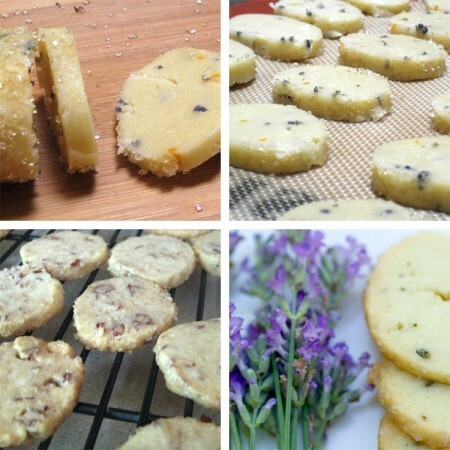 Last year I had tried a lavender sable recipe in a Provence Cooking School Cookbook, and they were scrumptionus, with an unusual menthol taste from the lavender. The ice box method of making cookies is really easy. The recipe I started with is adapted from the Martha Stewart Baking Handbook, one of my favourite and most reliable cookbooks, I highly recommend it as one of the most comprehensive home baking books available. When you make these, keep the logs very thin, I like about 1 1/2 inches. I like the cookies sliced very thin so the calories are also small, but I can tell you they taste just as good a little thicker. I must warn you that these are very addictive and that I have to ration them unless I want to walk several miles a day. They freeze very well, but like many shortbread cookies they keep a long time (like I have eaten them even a month old when I forgot them in a cookie can!) in a good tin cookie can). Experiment with other flavour variations. Another good combination is anise and orange. Anyway, the newlyweds like the cookies, so Bhaskar and Farhanna this post is dedicated to you and thanks for such an enjoyable weekend. This recipe is adapted from a basic butter cookie recipe from the Martha Stewart Baking Handbook. They are very easy to make, and delicious. 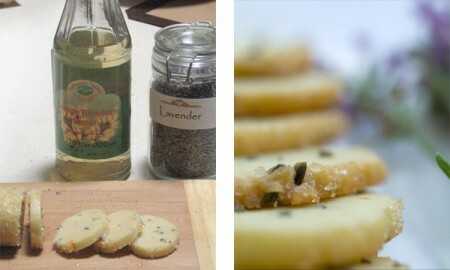 Here are two of my own favourite flavor variations, with the lavender being a somewhat different taste for a sweet cookie. If you don’t want to make two flavours, just double the ingredients and make one flavor for the whole batch. 1 egg Cream butter and sugar, add salt. Add egg, then the flour in batches. Mix until small crumbly mixture evolves and all the flour is incorporated. Divide the mixture into two equal size batches. 1 tsp shredded orange rind, avoid a micro grater size, larger such as the type from a little zester is better. ½ cup coarsely chopped pecans Add flavourings to each batch. Press dough together to form a long log about 1 ½ inched. Roll in parchment or wax paper and refreigerate (or freeze). To make cookies, roll log in sanding or coarse sugar to coat surface. Then slice into rounds ¼ inch think. Bake at 350 for about 15 minutes. These freeze beautifully but also keep at room temperature for about 10 days. This entry was posted on Friday, July 23rd, 2010 at 11:56 am	and is filed under Recipes, baking. You can follow any responses to this entry through the RSS 2.0 feed. Both comments and pings are currently closed.